You can prevent users from abusing the social WiFi network by controlling the bandwidth and session times of each logged in user. This is to provide quality social WiFi service without compromising browsing speeds. 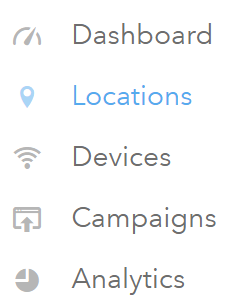 Go to Locations section through the left side menu. Search for the location where you want to set bandwidth and session times. Click the Settings button of the location. Once in the location setting, go to the Session tab. Toggle to turn on/off the Session Time Limit, Max Download/Upload Bandwidth and/or Daily Bandwidth Cap. Use the sliders to set the limit for session times or download bandwidth. Once a guest reaches their session time limit or daily bandwidth cap, they will be logged off from the network and they will only be able to log in into the network again after 24 hours. Good job soldier! You have defended the quality of your social WiFi service!